On the first album of Nox, the infinitely rich tunes and lyrics of Hungarian folk music are blended with the electronic music of the third millennium. The front man of the band is the acclaimed Nagy Tama's who is considered to be one of the greatest talents in Hungarian folk dancing. The lady by his side, Peter Szabo Szilvia, has an exceptionally beautiful voice; she was discovered by the producer. Now she has a great chance to prove her talent as a singer in the band. The singer of the band was born in Forraskut, a small Hungarian village. Nox is the very first stage of her professional career. She learned to sing without tuition – which is perhaps why she makes the Hungarian folk songs she sings sound so heartfelt and real. She finished high school and was able to devote all of her time and enthusiasm to the band which had been created around that time. He is the folk dancer and choreographer of the band. He has obtained a degree from the folk dance department of the Ballet Institute. As a solo dancer and the ‘ambassador’ of Hungarian folk dancing and folk music, he has travelled around the globe, performing in nearly every country of Europe, in the United States, in South America, and Australia as well. 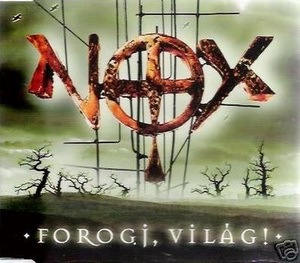 Nox was probably the biggest surprise on the Hungarian pop scene in 2002. Few people believed that a group that puts traditional Hungarian folk songs into a modern electronic context could achieve such a resounding success. But the record sales convinced any doubters, as the album ‘Heritage’ became a golden disc in only three months. It was a record that contained re-interpretations of the best-known Hungarian folk songs. Around 20,000 records were sold, and numerous gigs followed over the border and in Romania and Slovakia. In the autumn of 2003, their second album ‘Magic Spell’ came out in Hungary, Romania, and Slovakia at the same time. It was a real step forward without compromising the band’s sound, and it featured the band’s own songs rather than cover versions. It may sound like it contains obscure folk songs or pieces from a musical or rock opera, but don’t be deceived: all of its tunes were composed in 2003. The musical style did not change, essentially, but it has become more complex. In November 2004, NOX came out with a surprise album to please the audience at Christmas. The six songs on this Christmas record were specially written for Nox. In April 2005, Nox’s fourth album, ‘Shining’, will be released, with the intention of conveying real human values, as the first three albums did. And it should further strengthen the mystique of Nox. На первом альбоме группы Нокс мелодии и тексты народной венгерской музыки сплетены с электронной музыкой третьего тысячелетия. Фронтмэн группы - Тама Нагь считается одним из самых таланливых фольклорных танцоров. Сильвия, солистка, обладает одним из сильнейших голосов, ее нашел продюсер группы, и теперь она получила шанс проявить свои таланты. В ноябре 2004 года Нокс выпускают рождественский альбом с 6ю песнями, написанными специально для группы. - Hello, dear Szilvia, Tomi and other members of NOX, and our congratulations for you winning the Hungarian national final. How do you feel now, being selected a Eurovision singers? - We are extremely happy and proud to be able to repesent Hungary in this contest. - Are you usually following the Eurovision contest? If Hungary participated last years too, will you be running in NF as well? Will you run next year too? concentrating on the Final 2005. - How did you get the idea to participate in the Hungarian preselection this year? - It was no question. When we heard that we could nominate we decided it immediately. Representing our country is a great honour for us. - Fortunately, NOX is extremely popular in Hungary, therefore we hoped that the audience should give plenty of votes on us. With the jury, we were just hoping that the huge amount of work should benefit, and it did. - Was your song written specially for the National selection? - Yes. We were just making our new album and this song seemed to be suitable for the Contest, so we worked out a new choreography for the Eurovision 2005. - Please explain us what is your song about? - The song is about a feeling, a feeling that world needs to be changed to be a better place living in. The singer has a strong desire to go elsewhere to live, but with the joint will of people world can be changed so that man can also live here. - And how do you call it's style? world. This song is more up-to-date and is closer to pop music than other NOX songs used to be. - I believe that your band consists of more than 6 persons so who will be in those lucky 6 at Eurovision stage? staff to appear in Kiew as well. The orchestra consists of 7 persons and they are - in Hungary - integral part of the stage performance. - How can you judge other songs at the Hungarian national preselection? Did you like any of them? - We liked the song of Crystal and Tamas Mester. We had concerns about them both, but we succeeded. - First of all we would be glad to reach the final. If we succeed, we have the target to represent Hungary in a good way. They trusted us and it must be our duty to be thankful for this trust. - What as do you think can make your song stand different from the other competitors? This year a lot of performers went for the songs with some folk influences songs, and how you are planning to make your song one to remember? - The difference is in the vitality of the hungarian people. This is present in our song and in our dance! The only way we would like express it is the stage appearance and the fact that the song really comes from our heart. - What are your preparations plans? Are you planning some promotional tour? - Not, for the time being. We are just in the finish of our 3rd album and shall start our 80 sites live concerts starting 1st April. We are in the middle of the final trials. The audience shall see a monumental stage show with special effects. It will hopefully be marvellous! - Will the song be performed in English or Hungarian language at the contest? Are any other versions/remixes planned? - We shall perform in Hungarian. Hungarian folk song and dance can successfully be performed in Hungarian only. before the contest? Will be your stage presentation at the Eurovision similar to the one you had in the National final, or it will be different? - We do not and may not change. It is a strict rule of the Contest that songs may not be subject to any change in comparison to the national performances. The only minor change shall probably be that we shall work out the individual details so that the whole performance shall be more perfect. - Let's speak on your career. Most of our readers are not familiar with Hungarian scene. Are you a popular band there? - NOX looks back on a past of 3 years. We strted with 2 albums reaching gold and platinum prize in Hungary which is a very good result for the start. In 2004 NOX won the "Album of the Year" prize and also isued a special maxi for the Christmas. The 2nd and 3rd album contains own songs, however they also reflect the roots of hungarian folksongs and folkdances. Now NOX is one of the most popular hungarian groups and this can be proves by the high percentage of votes on the national Contest Final. - What is the title of your band NOX stands for, is it some kind of abbreviation? - NOX used to be the Princess of Night in the ancient mythology. - Are you experimenting with styles or you're stick to one? - We prefer our own style. You can only be successful when you stay in the style you are bound to. - Up today we have 2 albums amd a maxi CD last Christmas. We are just looking forward to our 3rd album, appearing April 2005. - Do you follow music industry of Hungary? Do you think it is close to European level? - Of course, we follow the hungarian pop trends although we differ from it in many ways. Hungary is up-to-date in the world pop trends and we can be proud of our music successes. - Szilvi: "The voice and the performance of Mariah Carey and Whitney Houston are vry close to me." Tom: "I'm a U2 fan". - Of course we saw Ruslana's song and performance among others. It was really worth winning! - We hope this Contest Final will be a good opportunity to know NOX better then before. We hope you will vote on the best performances and also hope that NOX will be among them! - И наконец, если вы хотите оставить какое-то сообщение посетителям нашего сайта, вы можете это сделать сейчас. - Мы надеемся, что этот конкурс поможет вам познакомиться со стилем НОКС, мы верим, что вы проголосуете за лучшие выступления и надеемся, что НОКС тоже будет среди них! - Большое спасибо вам за интервью, удачи и увидимся в Киеве! Сингл включает в себя основную версию, радиоверсию и ремикс. Igy valhat minden banat alomma "Spin, world!" Or i shall not live tomorrow! Don't play, world!- Let me go, if a happy land calls! I want to be somewhere else for a long time! I don't see any light, i won't wait for it! I disappear in the sky or on the ground, just anywhere! You are at the end of all hope. Don't ask, don't call, don't see me!